90% & 40% US Silver Coins. 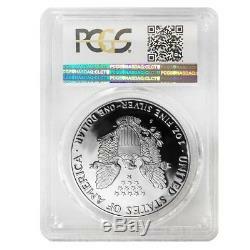 1986-S 1 oz Proof Silver American Eagle PCGS PF 70 DCAM. 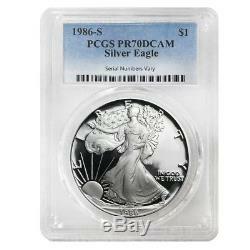 This beautiful 1986-S 1 oz Proof Silver American Eagle PCGS PF 70 will make an excellent addition to any collection. The coin comes graded by PCGS as Proof 70, a perfect score. The obverse features the iconic Walking Liberty design with the sun ascending behind her. Inscriptions include "LIBERTY;" "IN GOD WE TRUST" along with the year of mintage. The reverse portrays the Heraldic Eagle based on the US Presidential Seal, with 13 stars above its head representing the original colonies. Its beak holds a banner displaying the nation's patriotic phrase "E PLURIBUS UNUM" ("Out of Many, One"). Additional inscriptions include "UNITED STATES OF AMERICA, " along with the weight and denomination. If you have any questions or concerns, please contact our customer service representatives. By purchasing from Bullion Exchanges, you are agreeing to all of our Terms and Policies. Bullion Exchanges reserves the right to refuse or cancel any order reviewed by our Compliance Team, which are deemed questionable or have increasing potential risk for being fraudulent. All customers are subject to a review at our own discretion, in which additional information, identification and/or documentation, may be requested. A prompt response would help expedite the fulfillment of your order. Packages are no longer insured if the tracking information shows the package is delivered. The item "1986-S 1 oz Proof Silver American Eagle PCGS PF 70 DCAM" is in sale since Thursday, October 18, 2018. This item is in the category "Coins & Paper Money\Bullion\Silver\Coins".exchanges" and is located in New York, New York. This item can be shipped to United States.